This competition, which has also drawn in Democrats to such an extent that, on Wednesday, they spinelessly voted to withhold the funds needed to close the prison, and also to prevent the transfer of prisoners to the US, has generally focused on NIMBYist (“Not In My Back Yard”) responses to proposals to move prisoners from Guantánamo and incarcerate them on the US mainland, and has, for the most part, involved politicians who think that Americans are the toughest people in the world, and who have a network of impregnable maximum-security prisons, but who, nevertheless, have been wailing like babies about the “threat” posed by a group of men who have never been adequately screened, or received a fair hearing, to ascertain whether they are in fact a “threat” to the US. After this result, a vicious battle ensued between Judge Ricardo Urbina, of the District Court in Washington D.C., and Judges A. Raymond Randolph and Karen LeCraft Henderson in the appeals court. In an article for the Washington Examiner last week, and in an appearance on FOX News, Gingrich stated bluntly that he thought the Uyghurs should be returned to China. “Why is that our problem?” he asked. “Why are we protecting these guys? 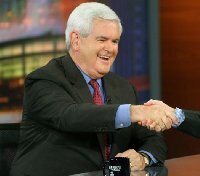 Why does it become an American problem?” “Send them to China,” Gingrich continued. Writing in the Washington Examiner last week, former speaker of the US House of Representatives Newt Gingrich warned the Obama administration that a group of 17 Uyghurs, held in Guantánamo Bay since 2002, would be a threat to US national security if transferred to American soil. “[T]hey are trained mass killers instructed by the same terrorists responsible for killing 3,000 Americans on September 11, 2001,” he wrote. Uyghurs are the Tibetans you haven’t heard about. Ethnic Turkic people from the Chinese Xinjiang Uyghur Autonomous Region, Uyghurs have long faced discrimination and persecution as a minority — a fact recognized repeatedly by the US Congress and State Department, which has noted China’s insidious strategy of using the US war on terror as pretext to oppress independent religious leaders and peaceful political dissenters. Uyghurs’ struggle for self-rule is one against dictatorship and communism, not one to establish a sharia state through violence (as Gingrich claims, in a curious echo of Chinese government propaganda). Nothing about the Uyghur cause involves hostility toward the United States or association with terrorist groups. In the case of the detained Uyghurs, this too has been recognized by the United States. In June 2008, a DC Circuit Court unanimously ruled that the US government’s designation of Huzaifa Parhat, one of the 17 Uyghurs at Guantánamo, as an enemy combatant was invalid. The US government’s case, they concluded, was insufficient, unreliable, and based on attenuated guilt-by-association reasoning. The panel found no evidence that Parhat was a member of the East Turkestan Islamic Movement (ETIM), that ETIM was associated with either al-Qaeda or the Taliban, or that ETIM had ever fought against the United States. Supposed proof that detainees had undergone “terrorist training” is dubious at best. The detainees were able to break down and reassemble a single Kalashnikov rifle. To classify this experience as “terrorist training” would require a radical logic leap. Every one of the 17 Uyghur detainees at Guantánamo has repeatedly denied being part of ETIM, or of being sympathizers of al-Qaeda or the Taliban. They should remain innocent — both legally and in public discourse — unless proven guilty. As the discussion about the fate of these men goes forward, it is not the danger that the Uyghur detainees pose to the United States that is of greatest concern, but the danger China poses to detainees. Were it not for the grave threat of persecution that these men face from the Chinese government, they would have been returned home years ago. In just one example from 2002, a US Department of Justice report cites claims that US agents at Guantánamo collaborated with Chinese counterparts in the rough treatment of Uyghur detainees prior to scheduled interviews with the Chinese agents. But why is the idea so preposterous? The Uyghurs are not a threat to US communities. Just look at the five Uyghur companions who were released from Guantánamo in 2006 and have lived peaceably and productively in Europe for three years now.